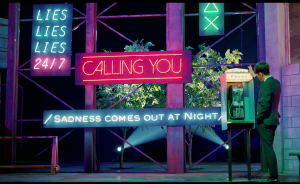 Highlight Struggles with Relationships in "Calling You"
It hasn’t been long since their “debut” with Can You Feel It?, but Highlight is back with a repackaged version of the album complete with two new tracks — the title track “Calling You” which is a fairly laid-back and easy-to-listen-to pop song, and “Sleep Tight”, a mid-tempo track with subtle rock flavours. The music video for “Calling You” is equally easy-to-watch, with each member getting their own storyline which eventually ties in a group dance performance in the final chorus. This song, in comparison to their previous title track “Plz Don’t Be Sad“, is a little more mellow. There are hints of nostalgia melancholy peeking through with the slower tempo as the members sing about drunkenly calling a past lover who simply does not pick up. It’s not exactly the characteristic summer song that’s sunny and upbeat, but it does speak of an experience that is highly relatable to viewers. Turning over to the storyline of the music video, there is a common underlying theme of drinking, and each of the members are shown to be drinking in different contexts to deal with their relationship woes. Kikwang is first up at the phone booth where he drunkenly stumbles to dial the right numbers. We later realise that he is a travelling soccer player, and the nature of his work may have put a hamper to his relationship. Doojoon, initially shown to be drinking with his colleagues at work; it is revealed later that his busy career trying to please the higher-ups cost him his relationship. On the other hand, Junhyung, walking around dejectedly, is both newly unemployed and single. Yoseob, portraying a student, has an unrequited love, and Dongwoon, although seemingly well-off and happily drinking with many friends, has actually gone through a recent break-up. It is also shown that each of the members take turns calling their past lover, with all of the calls going straight to voicemail. As mentioned earlier, all of these scenes take place in the same setting, a deliberate move to reflect the common theme of relationship troubles across a whole spectrum of people. It doesn’t matter your age, status, or career, these feelings of sadness and longing can and do still occur. These common themes of loneliness and, might I add, drunk calling your ex at socially inappropriate hours (and of course, reaching voicemail) are highly relatable to viewers and listeners. Many of us have probably had similar experiences, and the members of Highlight represent a wide range of populations — from a struggling office worker to an unemployed person to student with a one-sided crush — any of those could be us. This makes them more accessible to the general audience — they aren’t the perfect idols with perfect relationships, they are human beings just like us with relationship troubles. Ultimately, this builds Highlight’s image as the easy-going guys next door. Overall, Highlight’s music video for “Calling You” is a solid addition to their already impressive repertoire. Song-wise, it’s different from their previous releases, which show their diversity as a musical group, and music video-wise, it is interesting, extremely relatable to the common audience, and is simply fun to watch. There were some initial concerns about the group rushing to come back so soon after their previous release, but this music video definitely clears any worries in that regard!